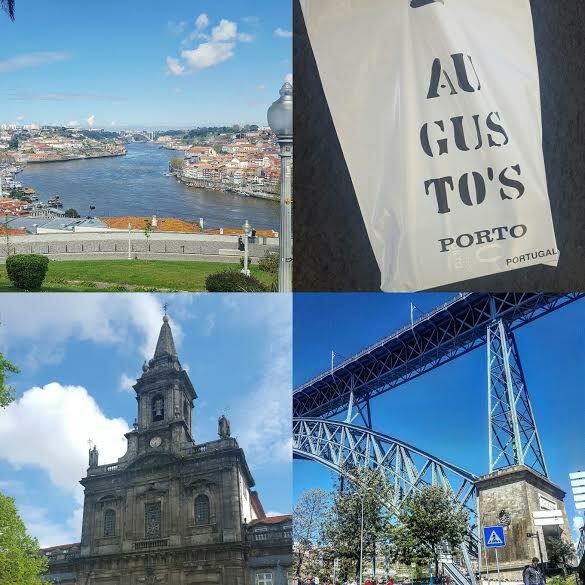 Recently I went on a little holiday when I came back to England, but decided that we would go to Portugal and I just loved it so much I wanted to share with you guys my trip! So I am splitting all 3 days into 3 different posts over one week! I know, it's been a long time since you have seen 3 posts in one week from me, but I didn't want to drag this trip out over 3 whole weeks. OK, so let's get started basically we caught the earliest flight we could which was at like 6:30 in the morning on a Saturday! I think when you only have a limited time in a different country you want to make sure you make the most of your time there. Even more so when you are looking forward to it as much as me, like every hour counts. When we landed we decided to get the metro to the centre, which was not only cheaper (4:30€ for two of us) but is kinda fun as opposed to getting a cab, it only took like 20 mins!! One of the first things I noticed was how pretty the buildings are, when I used to think of Portugal I kind of envisioned more simplistic buildings like in italy or even Spain but in Porto they had beautiful intricate designs, some had painted blue and white tiles on which was so striking, I wasn't expecting it. Another thing to note is how hilly Porto is, I mean it's on another level...literally! Some of the hills are so steep but I actually love walking so it doesn't bother me. We found ourselves walking over the famous Ponte Luis Bridge which gave an utterly beautiful view of the river Douro. Once we got to the other side we realised we would have to walk down the steep hills to get down to the river or take a cable car down...well you know I just had to take the cable car at like 5€ each it's definitely the best way to get down, not only this but you got a free little taster of port when you get down at a nearby port house. My first actual experience of tasting port...not gonna lie, it's pretty lush! I will go into more detail about the different ports on a later post. Keeping with the port theme though we were having a bit of a wander and stumbled across this really small port place that was family run called Augusto's! It was very welcoming and the guy gave us a bit of insight into the company and explained how they can't sell the port in supermarkets because it is just such a small place they cannot mass produce the port! They give you a little taster and if you buy the bottle they deduct the price of the taster from it. Needless to say, of course we walked out with a 10 year old Tawny port. After this we decided to retreat back to the hotel to get ready for the evening! For dinner we actually decided to stay closer to the hotel and not go as far as the river because we had done a lot of walking but we stumbled across this really lovely restaurant called Avendia! Now, let me just tell you, I had possibly one of the best steaks I have ever had in my life at this restaurant and it was served with a delicious peppercorn sauce! I even love the fact the waiter didn't ask how I like it, because a steak like that can only be served rare! It was delicious but amazingly only like 12€ or something. The staff was amazing, asking if we were ok and enjoying the food! I'll have to be honest here, I couldn't fit in any dessert but the chap I was with managed to squeeze something in and opted for a cheesecake! When it turned up, I was a little jealous but too full to even try it, however I was informed that the topping was like a black forest gateaux-ey thing, lush! To end the evening on the way hotel we ducked into a couple of bars just for one drink, a bar called Baixa Bar serves a wonderful red fruit caprioska and played some great music with a very relaxed atmosphere.